My Home Appraisal Came In Too Low. Now What? My property appraised too low! Home appraisals are often required for refinance loans. A “low appraisal” happens a lot more on refinance transactions than on purchase ones. The homeowner often has a figure in mind, but it’s not always based on actual sales in the area, or truly comparable sales. So, what do you do when you can’t refinance because of a low appraised value? See recommendations below. One option is to get a second opinion. Another lender will likely use a different appraiser who may come up with a higher value. But this isn’t without risk. You may end up paying for two appraisals and still no refinance. Read further for other ideas. What if your refinance appraisal comes in low? You can do a “cash-in” refinance, which is bringing cash to closing to make up the difference between loan amount and the property value. Keep in mind that if you cancel the refinance, you will most likely have to pay the appraisal fee. Likewise, ordering a new appraisal is no guarantee of a higher value, and you are on the hook for two appraisal bills. Plus, the lender may not allow an additional appraisal. Note that many lenders today are going with automated appraisals (AVMs) to save time and money. If you have made many home improvements since your purchase, or your home interior has features not obvious to a “drive-by” appraiser, you may want to insist upfront on a human appraiser, even if it costs more. One point to bring up: it’s very common for the homeowner to overestimate the value of their own home. The chart below shows the difference between owner opinions of their property value and the actual appraised value of the properties. When your home appraises for less than its purchase price, it affects your mortgage, and can affect your contract, too. Remember that mortgage lenders use the appraiser-determined value to input the “value” part of your mortgage’s loan-to-value (LTV) calculation. If the appraised value is less than the purchase price, lenders use that value to determine your LTV. Unless the seller agrees to lower the price, you will have to increase your down payment to get the same mortgage and interest rate. The possibility of a “bad appraisal” is among the reasons home purchase contracts are often written with an appraisal contingency. Should the home fail to appraise for its contracted purchase price, the contingency clause allows buyers to re-evaluate and, potentially, walk away. In fact, FHA loans require this contingency in any purchases financed with FHA mortgages. Appraisal contingencies are also sometimes used to renegotiate or exit contracts after an appraiser identifies required repairs, such as chipped paint or cracked windows. As a home buyer, it’s risky to waive your appraisal contingency. You may lose your negotiation leverage if the home appraises for less than its purchase price. If you’re selling a home, and it doesn’t appraise for your listing price, a few things could be going on. Your real estate agent may have listed the home too high. In this case, you may want to lower your asking price. There aren’t too many buyers who will kick in thousands of extra dollars to cover the difference. And there’s no guarantee that ordering another appraisal will yield the results you want. In hot markets, though, it’s common to list a home at a higher price, assuming that competition will drive values up quickly. Some markets rise so fast that appraisal values can’t keep up. An appraiser must base your home’s value on recent sales prices of similar houses. You have a few options, though, if the appraisal comes in low. While none of these may be ideal, they are options. If you are in no hurry, you can re-list the home at a later date for another try at getting top dollar. What happens if my new-construction home appraisal comes in low? This depends on what sort of loan you have, how the construction is being done, and how (or if) you have a construction loan. If you build a custom home on a lot that you own or purchase, you will probably get a construction loan to finance the build. When you take out a construction loan, the lender bases your loan amount on the “improved value” of the property. The appraiser uses information provided by the builder and current home values in the area to estimate what your house will be worth once construction is complete. Related: Fannie Mae HomeStyle vs FHA 203(k) construction and rehab loan: Which is better? Once the builder finishes the job, and the home receives its Certificate of Occupancy, your new loan pays off the construction loan. This new loan is called “permanent” or “take-out” financing. If the newly-built house does not appraise for at least its estimated value, you have some of the same options as any home buyer – try a new lender, get a new appraisal, or get the builder to take less. If the low appraisal is the builder’s fault – say, the quality of construction or materials were not as described in the loan application documents, you may be able to sue your builder. If your newly-built house is in a development, and you are financing it with a traditional mortgage, you’re in the same boat as any other buyer of a pre-built house. You have the same options – back out, renegotiate, make a bigger down payment, etc. If you finance your home construction with an FHA 203(k) rehab home loan, you might get lucky. The agency allows 10 percent “wiggle room” on the final appraised value without it affecting your loan terms. This also applies if you use a 203(k) refinance to add some home improvements when you refinance your property. The home buyer, in some cases, can request an appraisal rebuttal. This is a formal process in which the buyer’s lender submits a request for the appraiser to re-examine the value. Additional comparable homes may be submitted to the appraiser, as well as “missed” characteristics about the subject property that may add to its value. Related: Help! I need to appeal my home appraisal! These rebuttals often have little or no effect. Appraisers are reluctant to change a home’s value based on the report. The appraiser will submit a rebuttal response, stating that value has been changed based on new evidence, or that it wasn’t changed and why. With the exception of no-appraisal, streamlined refinance loans, nearly every mortgage application requires a home appraisal to get approved. While many lenders are using (at least for some transactions) automated valuation models (AVMs) to get an idea of your property value, the majority of transactions still involve a licensed human. Licensed home appraisers use three common methods to determine your property value. For home buyers and homeowners financing primary homes, the “sales comparison” method is the most common. When using the sales comparison appraisal method, a home appraiser compares the subject property (i.e. your home) to other, similar homes with similar physical attributes which are in the immediate vicinity. “Immediate vicinity” varies by region. In a dense city such as Seattle, Washington; Chicago, Illinois; or, San Francisco, the immediate vicinity for a home will be within 0.25 miles — usually not more than a few city blocks. In less-dense areas, the immediate vicinity of the subject property could range to several miles. Appraisers are most interested in similar homes within these areas. They look at such traits as: number of bedrooms; number of bathrooms; age of home; quality of home finishes; and square footage. They also consider the “appeal” of a home based on its school districts, and proximity to traffic and shopping, as examples. Then, for each comparable home, appraisers search public records for home descriptions, sales data, and other available information about a property. This data is used to formulate the value of the subject property. Suppose the nearly-identical home across the street recently sold for $600,000. However, it does not contain a finished basement like yours does. So your house might appraise for $620,000. Comparable homes sold in the most recent 90 days are hugely important in the sales comparison approach. Homes sold over six months ago are less relevant. There are two other methods for appraisers to value property — the replacement cost and the income approach. The replacement cost approach estimates what it would cost to purchase your lot and build a house like yours, then subtracts depreciation. This method is useful if you’re shopping for home insurance and want all competitors to have the same home value information. However, insurers will come up with their own valuation when they underwrite your policy. For the income approach, an appraiser researches rental data to determine what your home would rent for on the open market, and applies one or more formulas – typically gross rent multipliers or capitalization rates – to extrapolate your property value. This approach is most commonly used for investors and landlords. The one you choose depends on your goals. Each valuation tool has its merits and drawbacks. Automated valuation models, or AVMs, can be found online for free, and they estimate your property value by analyzing local listings and public record data, determining trends, and applying them to your property. If recently-sold, similar-sized homes (“comps”) in your area are changing hands for ten percent more than they did when you purchased your property, your estimated value will probably be about ten percent more than your purchase price. This is a pretty basic evaluation. Related: My home didn’t appraise for its purchase price. Now what? Obviously, the software has no way of telling if you just gutted your kitchen and added $50,000 in equity, or if your eccentric neighbor destroyed your view by painting his garage Barbie pink. An AVM doesn’t always “know” if some of the comps were distress sales, artificially lowering their prices, or if defects in a comp’s title affected its value. AVMs are useful for demonstrating trends – the direction and extent of changes in area values — but they’re much less helpful for valuing specific property. You can always get a free (usually) home value estimate from a real estate broker or agent – they do them all the time for potential home sellers. This client sales presentation (for that’s what it is) is called a CMA, or Comparative Market Analysis. The CMA is only as accurate as the agent’s knowledge of the area – they typically “eyeball” property differences and make judgments based on their experience. However, you should understand that agents’ main business is not evaluating — they might overstate your appraised value to get your listing. A potentially more accurate approach is paying for a broker price opinion, or BPO. Brokers with BPOR certification from the National Association of Realtors have completed special training to do this work, and lenders often commission BPOs to determine the value of foreclosure homes before putting them up for sale. To perform a BPO, the broker examines three recent local sales of property similar to yours, and three currently-listed houses, compares their condition and features to yours, makes numeric adjustments according to formulas, and offers a value estimate. A BPO costs between $50 and $125 for a typical home. How does the appraised value affect your refinance? The borrower’s access to different mortgage rates and options depend in part on the amount of equity he or she has. And that depends on the mortgage balance and the appraised property value. 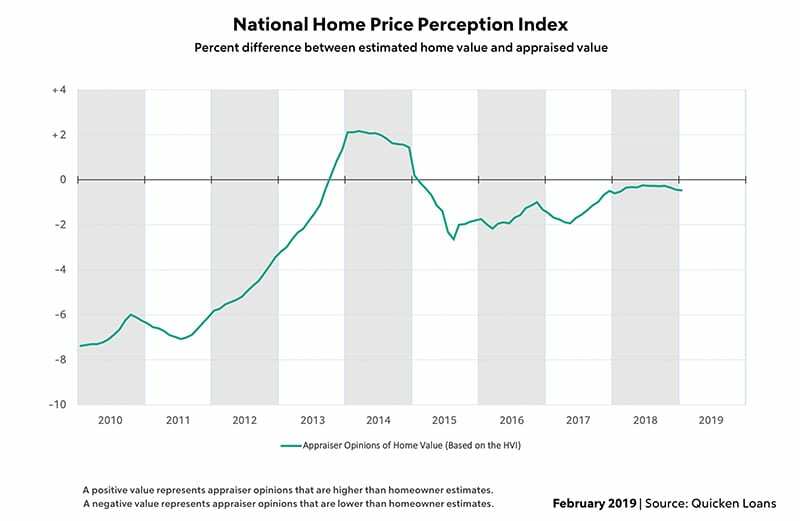 However, home appraisals don’t always come in “at-value”, which is to say that — sometimes — home appraisals assign a home value that is less than for what you hoped or planned. Sometimes, it doesn’t matter. You probably want to keep your loan-to-value at or below 80 percent. Above that, and you incur private mortgage insurance (PMI). You are could try an appraisal rebuttal (see below), but these rarely work. Instead, you could do a few other things. Homes don’t often appraise for less than their purchase price — especially in a rising home value environment. However, it can happen, so it’s best to know your options. You can comparison shop lenders and rates at the link below. While there are risks, it might be worth restarting your loan application to find an appraiser who might give you a higher home value.